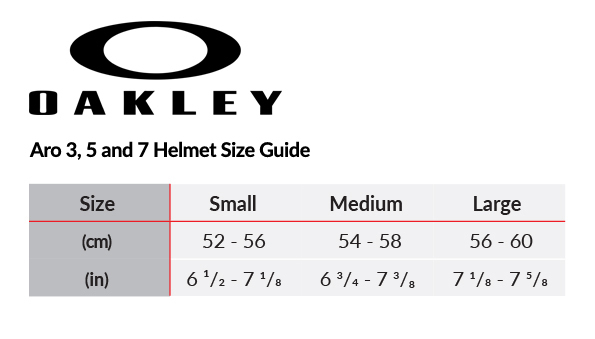 Tuned for speed and ready for heart-pounding sprint finishes, The Oakley ARO5 Helmet is an aerodynamic and comfortably lightweight design with BOA’s 360 degree fit system, MIPS Brain Protection, and a moisture wicking brow pad. MIPS Brain Protection System - A patented brain protection system to help provent heads against impact that can come from any direction. BOA FS1-1 System - The 360 degree fit system is the result of a colaboration between Oakley and BOA, introducing for the first time in cycling helmets, a TX1 Braided textile retention system. Designed and engineered for less interference with glasses and pressure againast the temple, the TX1 Lace lies flat against the athlete's head, allowing eyewear to sit naturally. Aerodynamics and Thermal Regulation - Inspired by the shape of racecars and designed to maximise aerodynamics without added drag. Anti-Microbial X-Static Browpad - Prevents stink by inhibbiting the growth of bacteria on fabric, eleminating human-based odor for the life of the brow pad. Optics Intergration - Eyewear Dock: Speciffically engineered to function without having to worry about eyewear interference. The Oakley ARO5 features an integrated eyewear dock to securely stow shades and keep them handy for quick easy access. Lightweight Polycarbonate shell - integrated eyewear dock to securely stow your shades and keep them handy for quick and easy access. X-Static brow padding - X-Static harnesses the power of silver to create a powerful technology that inhibits the growth of bacteria on fabric, eliminating odor for the life of the product.